Julie And James travelled to Horsham with Benambra confident he would be a good chance of repeating his last start. With Billy Eagan in the saddle again the confidence of the stable was well justified as Benambra won the Howdy NBN BM64 Handicap over 1400 meters by a neck at the odds of $15. In second place was the Darren Wier trained Snow Grumpy with a further 1 1/4 lengths to Net Profit in third. Benambra was slow to begin from barrier 11, but Billy Eagan didn't panic and let him find his feet and was soon sitting outside the leader. always travelling well, Billy made his move before the turn and hit the front coming around the turn only to be challenged by the favourite Snow Grumpy which Benambra was holding on the line. Benambra seem to have found a new lease on life since moving to the new training facility at Ballarat winning two from two starts here. With this win Benambra has won $102,605 from his 51 starts winning nine races, three seconds and seven thirds. Benambra is a great example of what Julie and James can achieve with racehorses as he is an eight year old and never had any soundness issues. He will have his next start at Donald over 1350 meters. The great recent form of the stable continued the next day at Mortlake where Melomane ran second being beaten right on the line by a head. 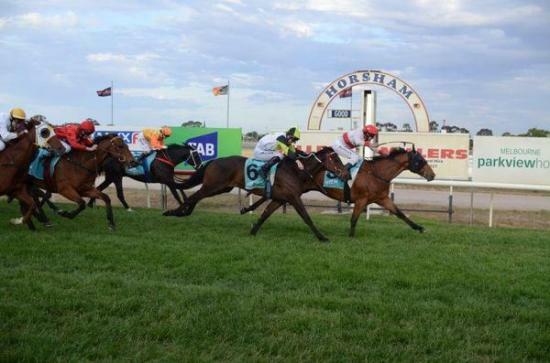 Since moving to Ballarat the stable has had four runners for two winners and a second.